On September 26, 2008, the John Jermain Library celebrated the end of a month-long program in which we explored Latino writing, music and films. 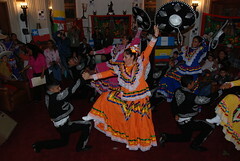 The celebration, held in the Library’s third-floor rotunda, featured food, music, dance, and other entertainment from Latin America. Roughly 100 people attended this delightful event. See more photos by clicking on the picture or link at right.